A Guru/Master is a spiritual guide who leads Jivas into inner enlightenment from eternal darkness, by initiating the seekers into the spiritual path. Baba Somanathji Maharaj was one such Perfect Master and initiated people into the path till 1976. Sadguru Baba Premanathji succeeded him as the Guru-in-Peeta to continue this mission till his demise in 1998. He has now been succeeded by Dr. M.B. Vasudevachari as the Guru-in-Peeta who has been continuing the mission of Satsangs etc. with the same traditional devotion and dedication. Baba Somanathji was born on the 7th of September 1885 in Firozabad, a village close to Gulbarga in Karnataka. His parents, Shri Siddaramappa and Shrimathi Sangamma named him Saibanna. His mother passed away when he was about three months old and he became totally orphaned when he lost his father when he was less than a year old. His father’s brother, Revanasiddappa, and grandmother Basamma looked after him. Under their care he had his elementary education in Marathi in the village. When he was ten years old his grandmother passed away. He and his uncle then moved to Solapur, where his uncle worked as a gardener while Saibanna worked in a cloth shop. Saibanna was deeply religious and God-minded, and a yearning for “Truth” was gradually developing in him and he began attending temples everyday. While at Solapur, an unsuccessful cotton yarn speculation business left him dejected and he decided to move to Bombay. There he studied the Scriptures and Vedanta in depth and started giving public discourses, while eking out a living in the food grain business. However, realizing that the mere reading of books without a Guru was useless, he started wandering around the country in search of a Master. In a village called Jogipur near Agra, he met Shivadayalnath, a sadhu who was an adept in Nath-Panth. Saibanna surrendered at his feet and begged him to initiate him into Nath-Panth. His guru initiated him into Shadakshri-Mantra, Pranayama, and other Yogic practices. (However, he was not instructed correctly in the method of Pranayama, and he developed complications resulting in severe abdominal pain and discomfort periodically, throughout his life). Saibanna, now renamed ‘Somanath’, by his guru, one day burnt his clothes, applied the ash to his body, and embraced the life of an ascetic. He wandered throughout India and visited places of pilgrimage like, Girnar, Pandarpur, Dwaraka, Nasik, Kurukshetra, Badrinath and the Himalayas upto Manasarovar. His ability to sit for Bhajan for several days at a time, together with his wanderings and discussions with the sadhus he met, gave him a great deal of knowledge and insight but he was unconvinced in the efficacy of Nath-Panth. In 1927, he met a school teacher in the Beas railway station who directed him to Sawan Singhji Maharaj. Baba Sawan Singhji was very pleased with Somanathji’s seva and behaviour and initiated him into the path of Surat Shabd Yoga in January 1928. He stayed at Beas for three and a half years, practicing Surat Shabd Yoga and achieved his cherished goal. In 1932, He sought the gracious permission of his Sadguru to return to Mumbai. Sawan Singhji blessed him and commanded him to propagate the principles of Santmat in South India, where it was almost unknown. Thus, he came to Mumbai and started a retail cloth shop at Worli for a living and began holding Satsangs (spiritual discourses) in the evenings. Due to his earlier association with Sri. Mahadevappa in Enumaladoddi, Andhra Pradesh, he started visiting this village for the benefit of seekers in that area. Baba Somanathji began ‘initiating’ his disciples in 1951. ‘Initiation’ meant establishing contact between the individual Soul and the Supreme Soul – otherwise described as putting an aspirant in touch with the Divine Sound Current (or Surat Shabd Yoga, in Santmat). Around 1955-56, he began regularly conducting Satsang programmes in Bangalore at the Oni Anjaneyaswamy temple, Palace Road. Many devotees were initiated into Radhaswamy faith and he was persuaded by some of his disciples to establish an Ashram in Bangalore. Hence, he along with some satsangis selected a suitable place to establish an Ashram. In 1958 he founded the Radhaswamy Satsang Sawan Durbar Ashram in Kengeri on an extent of 110 acres of agricultural land and transformed it into what is now a fully blossomed spiritual centre radiating an atmosphere of divinity, and a shrine for spiritual aspirants/seekers. Over the decades he established several Radhaswamy Satsang Centres in Karnataka, Andhra Pradesh and Maharashtra. Sawan Durbar Ashram at Kengeri together with all the Radhaswamy Satsang Centres established by Baba Somanathji Maharaj are exclusive and independent, wholly self-reliant; unaffiliated to other institutions likewise professing and promoting Radhaswamy faith in the country. Param Sant Sadguru Baba Somanathji Maharaj left his mortal coil on 28th Nov 1976 and merged with the Lord. 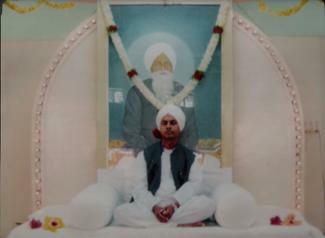 About ten years prior to his death, Baba Somanathji Maharaj in one of his evening satsangs declared one of his highly dedicated and devoted satsangis, Sri S.B.Pathrappa as his successor. Accordingly Sri S.B.Pathrappa, who retired as the Asst. Commissioner in the Commercial Tax Department, became the Successor-Guru-in-Peeta of Radhaswamy Satsang, Sawan Durbar Ashram, Kengeri, after the demise of Baba Somanathji in 1976. He was wholeheartedly accepted by the sangat (assembly of satsangis) and was named Baba Premanathji Maharaj. Sri Pathrappa was born on July 1, 1919 of parents Sri Sanganabasappa and Smt Veeramma in Siddapur, Bellary District, Karnataka. After his education at Bellary, he joined the Commercial Tax Department, Chennai, as an officer and in 1974 retired as an Assistant Commissioner in Bangalore. After his retirement he settled down in the Ashram for exclusive seva at the feet of Baba Somanathji Maharaj. He was an ardent disciple of Baba Somanathji and was initiated in 1953. He served his Master with absolute selfless dedication and was always available at the Master’s service. Though married to Smt. S.B. Pushpam in 1948, he lived a life of celibacy as Smt. Pushpam dedicated herself exclusively to the service of Sadguru Baba Somanathji Maharaj by staying in the Ashram. He led a noble, honest and simple life. Sadguru Baba Premanathji left his mortal coil on the 19th of December 1998. He strictly adhered to the principles laid down by his preceptor, Baba Somanathji Maharaj. He initiated thousands of seekers into the path of Surat Shabd Yoga and over a time, established many new centres of the Ashram. Smt. S.B. Pushpamma, the wife of Sri Pathrappa, along with her husband were satsangis and disciples of Baba Somanathji Maharaj. Smt Pushpamma dedicated her life to Babaji and the Ashram. She lived in the Ashram serving Babaji from the early 1950s, catering to the personal needs of Babaji - like writing accounts, washing clothes, cooking food and taking care of Babaji’s health and medication. From the early days, she also served as ‘Paatee’ for Babaji’s satsangs, i.e., reading hymns during Satsangs. She accompanied Babaji during his visits to the different centres and performed the role of ‘Paatee’. On May 2, 1993 Sadguru Baba Premanathji nominated Dr. Vasudevachari, an ardent satsangi since his school days, as his successor, which was endorsed by the sangat whole-heartedly. Dr. Vasudevachari was born on 28th September 1954 of Sri. G.S. Bhadrachari and Smt. Guramma at Malamachanahalli village, Kolar Dist, Karnataka. Both the parents were devoted satsangis of Huzur Baba Somanathji Maharaj. Dr. Vasudevachari’s parents brought him to Param Sant Sadguru Baba Somanathji Maharaj in 1968. He used to spend his school holidays in the Ashram and was initiated by Param Sant Sadguru Baba Somanathji Maharaj on May 8, 1972. After his primary education in the village, Dr. Vasudevachari studied Veterinary medicine in Bangalore and then specialized in Microbiology during his Masters Degree. He continued his education and obtained a Ph.D. degree in Microbiology from the Indian Institute of Science in 1984. In 1985 he proceeded to the USA to carry out research at the National Institute of Health, Bethesda, Maryland. On Sadguru Premanathji’s desire, he returned to Sawan Durbar Ashram in 1997.